I often joke about the fact that Tom and I have a mixed marriage. I was brought up Catholic in Wisconsin and Tom was brought up Baptist in southern Mississippi. Part of our vastly different upbringing was the types of foods we ate growing up. I was exposed to a wide variety of cuisines. Milwaukee has a large ethnic population, so I remember Mom buying prosciutto from an Italian deli and fresh tortillas from a Mexican grocery store. Mom taught cooking classes at night, and my sister and I would beg Dad to let us stay up to sample Szechuan pork or whatever scraps of leftovers there were. We ate lunch in a restaurant in Chinatown in Chicago, and Dad ordered random things off the Dim Sum menu, which was only in Chinese. I ate squid salad without flinching (although for some reason that one got to Dad, go figure!). However until I married Tom I had very little exposure to Southern American food. The one experience I remember was at an international food festival where the Southern booth had sweet potato pie. In our typical style, we ordered one piece of pie and 4 forks. We quickly went from small, hesitant bites to fighting over the pie and threatening each other with our plastic forks. We glanced back and saw the plump African-American lady at the booth completely doubled over with laughter after watching this crazy white family fight over sweet potato pie. That was the first time I remember tasting sweet potatoes. 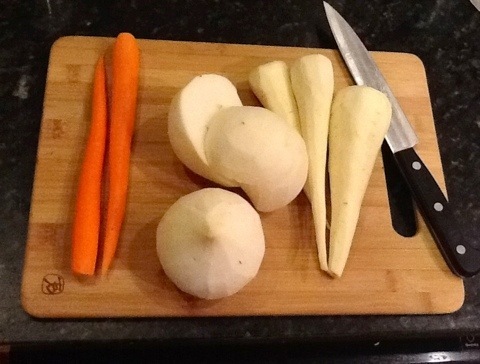 I wasn’t much on cooked vegetables until I went to college, actually (and I still eat half of the green beans raw while I am cutting them up to cook). Anyway, I’m usually the one encouraging Tom and the girls to try new foods, but Tom grew up eating a wider range of vegetables. 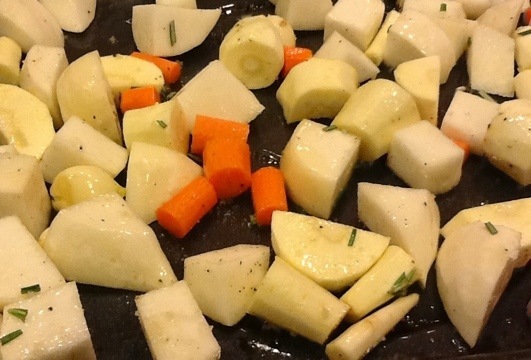 Chop vegetables into 2 inch pieces, peel garlic and toss with salt, pepper and a generous amount of olive oil. I also added fresh rosemary since I had some on hand. 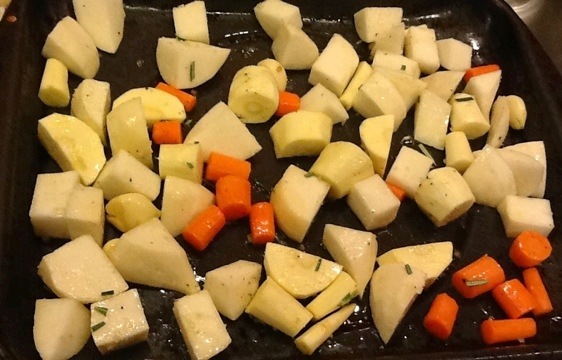 Roast for 15 minutes, turn veggies over, then check for doneness when you remember. I think these took at least 30 minutes to cook. I found this to be a tolerable way to eat turnips. 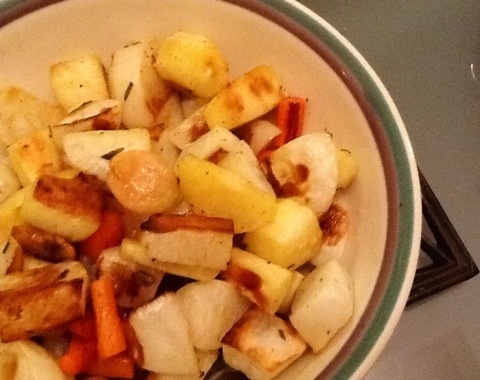 The roasting counteracts some, but not all, of their bitterness. 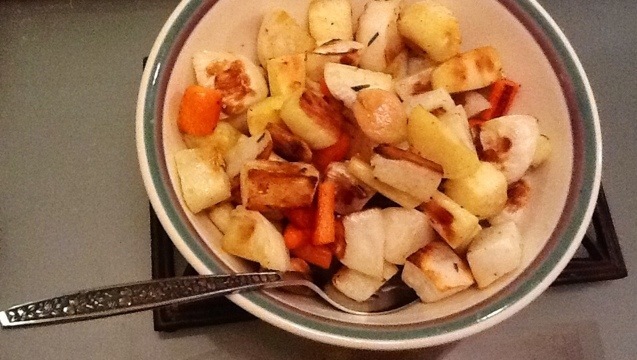 The parsnips and carrots were excellent fixed this way, and I would be willing to make this recipe again, although I personally would prefer to substitute sweet potatoes for the turnips. 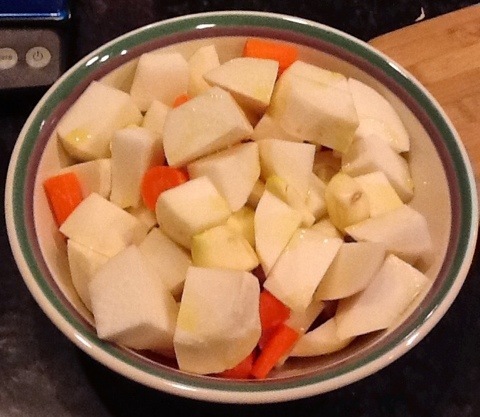 Jewel especially liked the parsnips, so I plan to look for other parsnip recipes.